Blog | B&K Timber - Bespoke Timber Gates to Suit All Budgets! Home / Blog | B&K Timber / Bespoke Timber Gates to Suit All Budgets! Bespoke Timber Gates to Suit All Budgets! At B&K Timber, we have been producing hand crafted bespoke timber gates for customers nationwide for over 30 years. In this time, we have become renowned for producing high quality gates which not only stand the test of time, but also enhance the exterior of many properties whilst guaranteeing security. One thing that distinguishes us from competitors is that we strongly believe that everyone should have the chance to be a proud owner of a beautiful bespoke timber gate which is why we offer a range of styles to suit all budgets! If you're looking for a new garden gate, look no further than B&K Timber For something cost effective, we recommend our simple Straight Top Economy Gate or the quaint Shaped Top Economy Gate. Alternatively, if you are looking for something more luxurious you will love the Broughton Gate and our enchanting Woodland Garden Gate! Whatever your style or budget, we guarantee to have something you'll love! If you're looking for a new driveway gate, we have a fantastic range of bespoke timber gates which will instantly enhance your property. 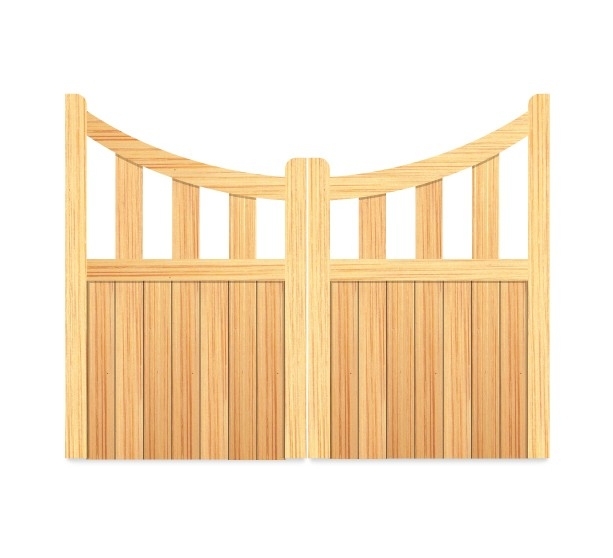 For a cost effective gate we recommend our most popular option, the Sherwood Gate. However, if you would like something more luxurious we have a fantastic collection of top end gates including the beautiful Brereton gate or our stunning Westport Gate! All of our bespoke timber gates are made to measure and are handcrafted from Scandinavian timber which is PEFC and FSC certified. We also treat our gates with a spirit based wood preservative to ensure long lasting protection against the elements. For high quality bespoke timber gates to suit all budgets, choose BK Timber! Find Out More About Our Bespoke Timber Gates Today! If you would like to find out more about our bespoke timber gates, please do not hesitate to get in touch with a member of our expert team. We regularly supply gates to customers across the UK, and you can see some examples of our bespoke timber gates by taking a look at our gallery.